Wind turbines on the mainland as seen from the backside of Padre Island National Seashore, at mile 25 on the four wheel drive only beach. Photo © Bruce Melton, 2012. For decades, the concept of installing privies in every house, business, and public building, and then piping human waste to a central treatment system, was perceived as lunacy that would bankrupt society. AUSTIN, Texas -- The shift in public opinion about climate change will likely only grow larger. This shift has been caused in a large way by an increase in unprecedented extreme weather caused by climate change, as climate scientists have been warning us about for 20 years. Americans are beginning to disregard what the “voices” have been telling us about the great climate science conspiracy. Some of the most amazing evidence of how much our climate has already shifted has now been published. A vast majority of Americans have been highly supportive of our government acting on climate change, even before the shift in public awareness began. Analysis of our leaders' positions on “green” issues, vs. their success in 2008 and 2010, shows that vocal support for “green“ issues led to success more often than silence on the issue. 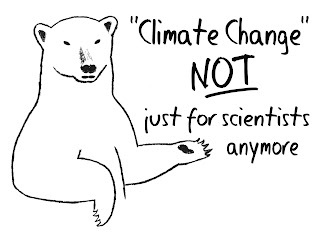 It is time to change the climate tone to one of aggressive vocal advocacy for the consensus position. I would like to begin this final part in the series by repeating a little from Part Two. Richard Alley, Evan Pugh Professor of Geosciences at Penn State University, one of the lead authors of the 2001 and 2007 IPCC Reports, member of the United States National Academy of Sciences and one of the pivotal international researchers in climate science, tells us in his book, Earth the Operators Manual, that about 100 reports have been published concerning the economic impacts of the solutions to climate change and they are focusing in on one thing. The solutions to fixing our climate pollution problem will cost about one percent of global gross domestic product every year for 100 years. I’ve already told you that Alley says this astronomically sounding $540 billion a year is no more than we have invested in the cost of installing toilets and the infrastructure to collect, clean, and dispose of toilet water. Here’s more. In the U.S. we need to spend about 0.75 percent of our average household income every year to maintain our sewer and water infrastructure ($375 per family considering the Census Bureau’s median household income of $50,000 per year in 2006). The Organization for Economic Cooperation and Development tells us most of the developed world spends 0.5 to 2.4 percent of household income on this task with the U.S. being the lowest. Other things that show the simplicity of this challenge include: in 2011 we spent $494 billion on marketing across the globe according to eMarketer Digital Intelligence; the U.S. annual military budget (not including wars) is right at a half billion dollars; the Congressional Budget Office says the Bush tax cuts cost about $115 billion a year or approximately the United States share if we are divvying this thing up according to who emits what; an article in the Bulletin of the American Meteorological Society in June 2011 tells us that routine weather events such as rain and cooler-than-average days can add up to an annual economic impact of as much as $485 billion in the United States alone; and in 2009 we spent $2.5 trillion in the U.S. on health care. This is five times what Alley tells us the economics scholars think the cost of worldwide climate pollution control will be. One more very important thing to consider about what professor Alley tells us is that these economic analyses only considered the costs. Not considered were the profits from the construction of the climate change pollution prevention devices, profits from avoidance once a carbon pollution tax is finally implemented, and benefits from the jobs created to build and maintain this new infrastructure. Also not considered would be the benefits to society of a clean energy economy. So why is the general public not aware of the relative simplicity of the task of simply cleaning up the largest form of pollution caused by a single species in the known universe? It’s “The Voices”... It’s the voices and their campaign of deceit, discreditation, and disinformation that is almost complete. Their money reigns supreme. The widely popular Wisconsin gubernatorial recall election on Tuesday, expected to be a closely contested contest, was blown to smithereens as Citizens United allowed just a few moneyed interests to outspend the Democrats by eight to one or $30.5 million to $3.9 million, says CBS News. At the same time in California, the state with the lowest smoking rate in the country, there was a proposition on the ballot for new anti-smoking dollar-a-pack tax on tobacco products to fund cancer research. Bolstered by $12 million in anti-smoking campaign, it reached a 67 percent support level in March. It was slaughtered by tobacco industry advertising of $47 million in the final weeks. They won by less than a percentage point. Big brother is here, and it ain’t the government. Let’s return from this world of corporate control and look at the real science some more: The money required to clean up climate pollution considers existing off-the-shelf technologies to do the job. Billionaires around the globe are investing in new technologies to do the job at a fraction of the price and earn billions in profits. Remember, half a trillion a year is at stake. One of the leading examples is Global Thermostat in California that has developed a prototype that they say, if ramped up, could solve our climate pollution problems in 30 years for only $2 trillion or $70 billion a year. This is an eighth what most of the economic evaluations are saying is needed to do the job with existing technologies. To finish these optimistic thoughts, there is a lot of messaging around focused on geoengineering and the wrong-headedness of such ventures; that this message will give people permission to emit more greenhouse gases and not reduce emissions. Atmospheric carbon capture and land-based storage cannot be compared to pumping carbon into space through a hose suspended in the sky, putting bazillions of tiny mirror-like particles in the upper atmosphere to reflect the sun or a sun shade umbrella in deep space or any of the other grand-but-dangerous schemes. Removing CO2 pollution from our atmosphere is little different from picking up trash on the beach or the side of the road and putting it in a landfill. The scale may be larger, but the comparison cannot be made to geoengineering’s risks. To think that this type of pollution cleanup is wrong-headed, that it will give people permission to emit more greenhouse gases, is no more wrong-headed than thinking that picking up trash on the side of the road will give people permission to litter even more. As Lord Nicholas Stern tells us (once chief economic advisor to Prime Minister Tony Blair and author of one of the most complete economic evaluations to the solutions to climate pollution -- the Stern Report), we have to do everything we can at the same time to solve this problem. How valid is the trend? To be certain that a change in tone can be beneficial we need to know that the trends in awareness and climate change are valid and likely to continue. Because a significant portion of the awareness shift has been created by climate changes that have already happened, it is logical to assume that because the weather is predicted to become more extreme with greater warming, the awareness shift will likely continue to grow. A really amazing piece of research that was recently published shows how much our climate has changed in the last 30 years. It shows that extreme temperature events are now occurring 10 to 100 times more frequently than during the period 1951 to 1981. This major piece of virtually unknown climate science comes from a paper in-press at the Proceedings of the National Academy of Sciences (PNAS) as submitted by scientists from NASA and Columbia’s Earth Institute. 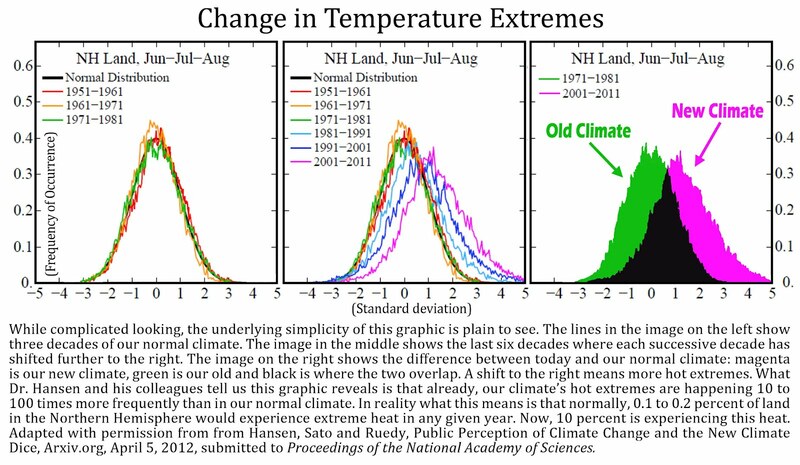 This change in climate that we have already seen can be related to having a 100-year heat wave every one to 10 years. This is like having the drought of the century -- the drought of record -- every one to 10 years. In another 30 years if the rate stays the same we can expect to see something like the thousand-year heat wave or the 10-thousand year heat wave happening every 10 years. This is exactly what we have been warned about by climate scientists for over 20 years. The rate of change is expected to accelerate as we continue to delay emissions reductions. 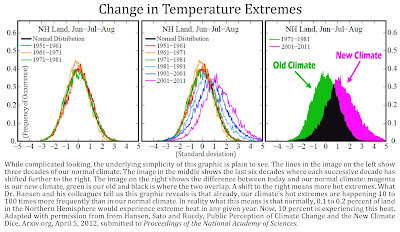 The graphic below from this study by NASA’s Goddard Institute for Space Studies and Columbia shows how markedly, persistently, and increasingly our climate has changed in the last 30 years. To start with, this research evaluates Northern Hemisphere temperature. Northern Hemisphere temperatures have warmed more than the rest of the planet because there is more land in the northern half of our planet. The temperature increase over our oceans is smaller than over land because of what is called thermal inertia, or the ability of water to absorb more heat than land. This absorbed heat is transferred to deep cold water via sinking ocean currents and limits warming over oceans. This means that the changes that you and I are likely to experience will be greater -- two times more than the global average. 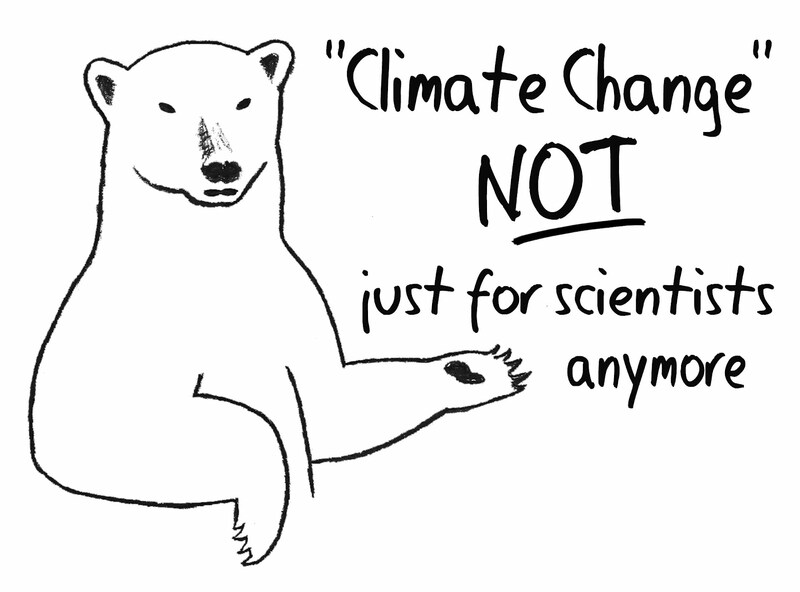 This is something that is very important in climate science that rarely gets acknowledged in the media. Up to 9 to 11 degrees of average warming across the planet by 2100 means up to 18 to 22 degrees of warming across large parts of Earth’s land surfaces. Starting with the image on the left, three decades of temperature extremes in the Northern Hemisphere are graphed (red, orange, and green lines). The similarity between decades is obvious and represents the stability of our climate during this period. The middle graphic adds data for the three most recent decades (cyan, blue and magenta). A new category of hot summertime outliers has emerged... with the occurrence of these outliers having increased 1-2 orders of magnitude [10 to 100 times] in the past three decades. Thus we can state with a high degree of confidence that extreme summers, such as those in Texas and Oklahoma in 2011 and Moscow in 2010, are a consequence of global warming, because global warming has dramatically increased their likelihood of occurrence. The perceptive person (old enough to remember the climate of 1951-1980) should recognize the existence of climate change. This is especially true in summer. Summers with [average] temperature in the category defined as "cold" in 1951-1980 . . . which occurred about one-third of the time in 1951-1980, now occur with a frequency about 10%, while those in the "hot" category have increased from about 33% to about 75%. These extreme [hot] temperatures were practically absent in the period of [1951 to 1981], covering only a few tenths of one percent of the land area, but they have occurred over about 10% of land area in recent years. This work out of NASA is yet another very compelling description of how our climate has already changed and there is no reason, academically or logically, to believe it will not continue to change and that the changes will not continue their trend of acceleration. 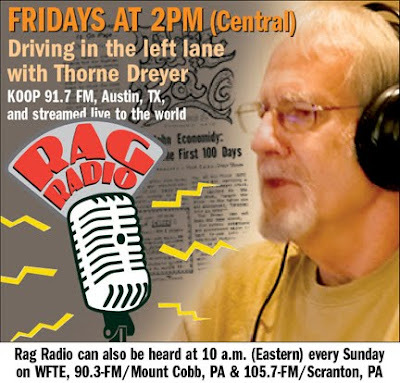 Putting two and two together; considering the reason why public perception has changed because of the increase in extreme weather and the likelihood that the extremes will continue to become more extreme faster, there is no reason to believe that awareness will not continue to grow. This assumption must also consider some decrease in awareness for relatively short periods from hyper press coverage of events/messages that are designed to discredit climate science or possibly support the election of a Republican as president in November. But for the last three years, political cues have changed and these cues have resulted in part of the change in public opinion about climate. Also related to political cues are these two new movements called Tea Party and Occupy. These two groups are more similar than one might think. Their political and social messages are generally far (way far) apart, but their motivation is a different story. Both groups seem to be motivated by what they feel is a loss of control where government/politics and or big business/big money and their government/political relationships are concerned. Big business, money and its corresponding political support among conservatives has vastly shaped the world of political “cues” related to American’s beliefs on climate change. As the country’s support of conservative leaders or institutions increases or decreases, awareness of climate change issues also increase or decrease as described by Lieserwitz 2012 (the Yale paper from Part One). The important concept here is that both the Tea Party and Occupy believe that politics and/or big money have negatively influenced government. These folks do not trust politicians/government and big money. This is a widespread sentiment of the American public that can be seen in polling on banking, insurance, and U.S. lawmakers. Not surprisingly, these movements are not just American. In Europe they have the Pirate Party, and very similar to both Occupy and the Tea Party, their goals are nebulous and as yet ill-defined. What the Pirate Party can decide on however is they want to see transparency in government and Internet freedom. The views of conservative vs. liberal politics towards climate change are apparent all around us. Conservatives generally disagree with the climate consensus and liberals generally agree. But the widespread nature of this relationship tells even more of the story. 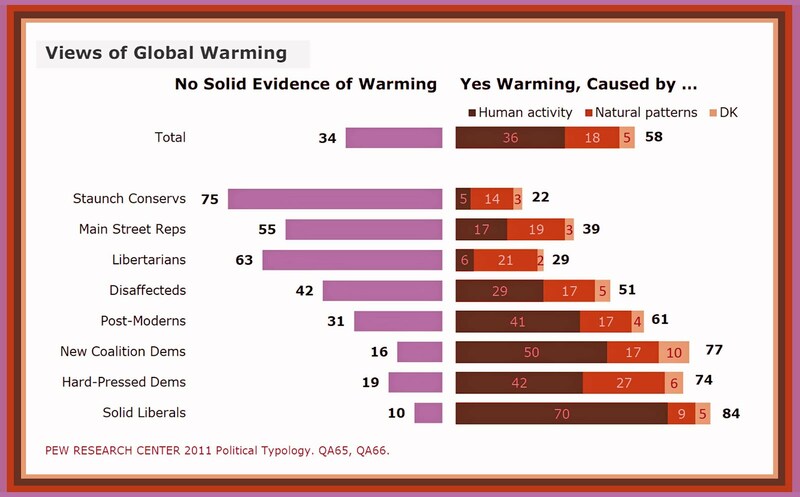 A Pew Center study of the climate change beliefs of different individuals has looked at eight classifications of conservatives and liberals (in the Graphic “Views of Global Warming,” staunch conservatives are “Tea Partiers”). A more in-depth description of the other types can be seen at the link in the references, but for the most part the rest are somewhat more easily identifiable. This work shows very graphically that an increase in liberal politics means an increase in the belief of the scientific consensus. A fall 2011 survey by the Brookings Institute tells us that 78 percent of Democrats believe there is solid evidence supporting the consensus on climate change where only 47 percent of Republicans believe there is solid evidence. 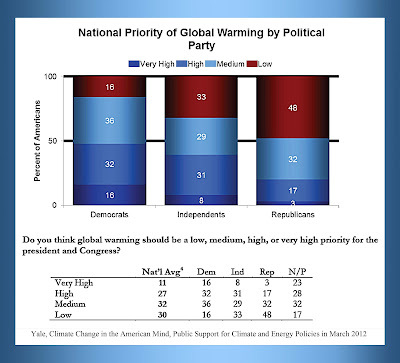 A study out of Yale and the George Mason Center for Climate Change Communication in March 2012 (in the graphic “Climate Change in the American Mind”) looks at the issue differently. It finds that nearly twice as many (38 percent) of Democratic respondents believe the national priority for global warming should be high to very high vs. Republicans (20 percent). Also of note in this study, 56 percent of Republicans in October 2011 believe global warming priorities should be low vs. 48 percent in March 2012. A study in Sociological Quarterly from April 2011, carried out by McCright and Dunlap of Oklahoma State University and led by Michigan State, analyzed 10 years of data from Gallup's environmental poll and found that the gap between Republicans and Democrats who believe global warming is happening widened by 30 percent from 2001 to 2010. The Pew Center’s latest (March 2012) also tells us that 51 percent of Republicans and Independents say it is warmer but it is due to natural causes while 47 percent of Democrats say it is due to manmade global warming. From the March 2012 Gallup survey, 43 percent of Democrats believe warmer than normal temperatures are because of climate change, vs. 19 percent of Republicans. On the topic of American’s beliefs about government action on climate change: CNN April 2011 tells us that 71 percent of Americans favor funding for the EPA to enforce regulations on greenhouse gases. Gallup says in June 2010 that 42 percent favor the Obama position on climate change vs. 33 percent that favor the Republican position. ABC News/Washington Post in June 2010 finds that 71 percent of Americans think the federal government should regulate the release of greenhouse gases from sources like power plants, cars, and factories in an effort to reduce global warming. Virginia Commonwealth University 2010 reveals 51 percent of Americans feel that the federal government is doing too little to reduce global warming. Pew Center 2010 adds that 52 percent of Americans favor setting limits on carbon dioxide emissions and making companies pay for their emissions, even if it may mean higher energy prices. USA Today/Gallup 2009 said that 55 percent of Americans favored the U.S. signing a binding global treaty at the Copenhagen Summit that would require the U.S. to significantly reduce greenhouse gas emissions. Finishing off these numbers, the MacInnis, Krosnick and Villar study from Stanford and Woods Institute in 2011 analyzed the 2008 presidential election and the 2010 Congressional/Senate election and found something surprising. Democrats who took “green” positions on climate change won much more often than Dems who remained silent and Republicans who took “not-green” positions on climate change won less often than Republicans who remained silent. MacInnis tells us his research suggests that elected officials should take vigorous public positions on climate change because most Americans view this favorably. Democrats won 69% of the races in which the Democrat took a green position and the Republican was silent/mixed. Democrats won 68% of the races in which the Democrat took a green position and the Republican took a not-green position. Democrats won 18% of the races in which the Democrat took a green position and the Republican also took a green position. Democrats won 17% of the races in which both candidates were silent/mixed. Democrats won 4% of the races in which the Democrat was silent/mixed and the Republican took a not-green position. Democrats won 0% of the races in which the Democrat was silent/mixed and the Republican took a green position. It is interesting to note that these findings have simple implications for Democratic campaign strategies but tricky ones for Republicans. It appears that Democrats enhanced their chances of victory by taking a green position, regardless of what their Republican opponents said on the issue. But the optimal strategy for Republicans appears to have hinged on what their opponents said. If a Republican could be confident that his/her Democratic opponent would remain silent on climate change, then the Republican would have gained by expressing a not green position. But once a Democrat expressed a green position, the Republican would have been wisest to remain silent/mixed, because expressing a not-green position appears to have hurt his/her chances of victory. From the press release for the study Krosnick tells us: "Our studies show no decline in public belief in the existence and threat of climate change, and that politicians might benefit from taking a 'green' stance." The Yale study Climate Change in the American Mind, tells us that three Americans to one would be more likely to vote for a candidate that supports a “revenue neutral” shift in taxation increasing fossil fuels taxes and reducing federal income tax by the same amount. Breaking it down by party, Republican respondents would support such a shift by two to one, Independents three to one, Dems five to one (74 percent). In the presidential vote this year, 55 percent of Americans say that global warming will be one of several important issues they use to determine how to cast their vote (60 percent Dems, 41 percent Republicans and 59 percent Independents). Awareness about climate change issues is increasing because of political cues and unprecedented weather actually caused by our already changed climate. Republicans overwhelmingly disagree with the scientific consensus whereas Democrats agree. Only 60 percent of climate scientists believed that Earth was warming in 1991, compared to 97 precent today. Americans' views on climate change are about 20 years behind those of the vast majority of climate scientists. Lawmakers voicing an opinion on “green” issues are much more likely to win than if they are silent and Democrats are much more likely to win if they voice a positive “green” opinion. Climate change impacts happening now are making the case for us. Public opinion is changing directly because, in the backs of our minds, we have been listening all these years. Now we see the predictions coming true and are converting. The extremes are convincing people through messaging work that has already been performed. Not that we don't need to do more. This article has been all about starting new campaigns with a different tone. The conversions will continue as the extremes continue to ramp up. The majority to the vast majority of Americans already believe and already want our government to act. What needs to be done now is to convince those already convinced that things are bad enough and that the predictions are valid enough that they need to do something about it themselves, or that they and their children will face the balance of the predictions of dangerous climate change. We can completely circumvent the dissenter’s campaigns. Disassociation is what is needed. Their message is not credible. This is about convincing our leaders that the time has come to do something. And how do we do that? We simply threaten them with un-election. Tried and proven, this tactic can change their votes in mere minutes. But we have to have enough warm bodies engaged. Enough voters need to own this issue to convince our leaders that it's our way or the highway. With even more dangerous climate changes still in the pipeline, the voting stance of our elected leaders will change organically like the change in public awareness that we have seen in the last several years. But this will take time that we may not have. If we help it along it will come faster. Twenty-first century social media have had great impacts on politics recently in numerous issues and these include: Obama’s election in 2008, the Tea Party and Congressional elections in 2010, Iranian elections in 2010, Occupy Wall Street, Arab Spring, Stop Online Piracy Act (SOPA), Planned Parenthood and breast cancer screenings, Rush Limbaugh’s feminist comments blowback, KONY 2012. There are about 250 million Internet users, over 100 million smartphone users, 133 million Facebook users and over 24 million Twitter users. This is no longer the 20th century. “Click” activism is here. What we did back then, and in the early part of this century, before we decided that climate change was a dirty word, is not going to work today. We need to rely on different strategies. The voting statistics tell us that Dems who speak up about green issues win more often than those who remain silent. Why are we not speaking up? Social media has obviously made a difference recently, so why are we not embracing this technology with our message? The climate change denial tactics of the conservatives have obviously been successful. It is only when Mother Nature's brute force exerts more influence on individuals that the tide has begun to turn. Why are we not using the tactics of the conservatives to help our citizenry understand what they should do? Why are our Democratic Party leaders not refusing to do one single thing conservative politicians want us to do instead of compromising beyond our principles? Why are we not using emotional issues in aggressive ways, like the Conservatives’ messaging campaigns, to convince the undecided that they need to pay attention to what the climate scientists are saying about our children's future? Why are our Democratic Party leaders not standing on top of the conservatives' misrepresentations of climate change and repeatedly revealing them to the American public for what they are? Why are the vast majority of us “silently” supporting the climate science consensus when an aggressive vocal stance wins more often? It’s time to come out of the climate closet and take a deliberate stance. The era of politically incorrect climate change messaging is over. Take a stand and urge your leaders to take a stand. We can vote the disbelievers off the climate island and win.